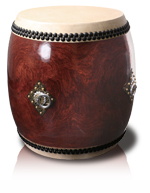 We manufacture, sell, repair, and lease wadaiko drums. Mon. and holidays are closed. [Click here] for a map on GoogleMap (will open in a new window). 1 minute walk from JR Ashiharabashi station. - From the Hanshin expressway, take the Nanba exit and turn left at the first light. Turn left at the Ashiharabashi intersection. - From the Hanshin expressway, take the Ashiharabashi exit and turn right. Shin (heart): Based in Naniwa, long known for the manufacturing of taiko, we handcraft each instrument to deliver sounds that reach your soul. Gi (technique): With craftsmanship inherited over hundreds of years, we maintain true Japanese tradition. Tai (body): We strive to fulfill your needs with our refined business structure. With Shin-Gi-Tai as our motto, we at TaikoMasa aspire to contribute to the community through matsuri festivals, music, shrines and temples, and to uphold Japan's precious cultures and traditions in today's fast-moving civilization. 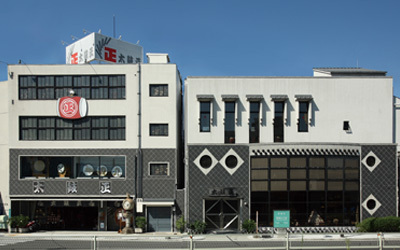 TaikoMasa is located in Naniwa-ku, where many taiko craftsmen gathered during the Edo period, quickly boosting the region to one of the largest manufacturing sites for taiko. Furthermore, wadaiko has historically been a traditional craft of Osaka. Inheriting the manufacturing techniques of the region, we handcraft each instrument in the traditional way to deliver sounds unchanged over the centuries. In addition to manufacturing and recovering, we also provide body repair services. Please feel free to contact us for details. TaikoMasa - your partner in creating authentic Japanese sounds. Manufacturing, repair, and sales of wadaiko. Sales of items for matsuri festivals (danjiri, futon daiko, mikoshi, etc. ).